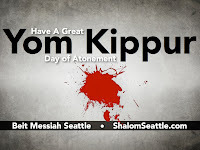 Don't Have An Easy Fast For Yom Kippur! Have a great, awesome, hard, painful, encouraging 25 hours of fasting. So that when we come through it, we can delight in our God together and sound the Shofar again at the closing service on Saturday knowing that God was/is faithful to hear our prayers. My Version of Messianic Judaism is The Right One! A few months ago I wrote about how Messianic Judaism needs to change. Sometime before that I wrote about a "grassroots" event that my congregation hosted in Seattle. At this event there was a beautiful moment that happened when young leaders from messianic synagogues and young leaders from Jews for Jesus came together and repented for not loving each other and treating each other as being a part of the same movement. It was, in part, spurred by the life and death of one of the founders of Jews for Jesus, Jhan Moskowitz, who was a man of God who always preached unity in the messianic movement. We just passed the one year anniversary of Jhan's death and he has been on my mind a lot. I was jogging yesterday morning and I began to weep (not that odd for me) because of something the God of Israel has been doing in my heart and mind over this last year. I grew up with the idea that my version of Messianic Judaism is the "right one." I would look at other forms of Messianic Judaism or Jewish people that belonged to churches and I would think "If only they would live like a real messianic Jew should. If only they would live like me." It now seems so painfully obvious to me that my attitude for most of my life has been...well...sin. This brings me back to my weeping (which, by the way, is difficult to do while jogging!). As we approach Yom Kippur this weekend I am in a place of repentance. I no longer think my way is the right way. Don't get me wrong. I like the way the I live out Messianic Judasim and I think there are essentials to what we belive if you are going to call yourself a "Messianic Jew" or a "Messianic Gentile" (Listen to my series at Beit Messiah on this called "Back To Basics"). But, I have come to a place where I realize that there are many ways to walk faithfully with Yeshua the Messiah. I don't want to judge how other people walk. Especially amazing ministries like Jews for Jesus who are celebrating 40 years of "making the Messiahship of Jesus an unavoidable issue." I am not the keeper of the best version of Messianic Judaism. Don't kid yourself, you aren't either. This is a new day. I recently (October 18-20 2013) spoke at the Jews for Jesus Ingathering East Coast. I feel so silly for pushing them away because some people are offended by their work. I have believed for so long that my version of Messianic Judaism is better than theirs. Instead, I will move forward, with them, in doing the most important work of making Yeshua known. First to my Jewish people and also to the rest of the nations on earth!